Designing an intercom system can be maddeningly complex. Every manufacturer requires specifying a handful of pieces to bring everything together. Forgetting just one part of the system can be a huge mistake that erases any profit. Are better options out there? In this update, we profile a simple intercom system from Stentofon named Pulse, clarify its advantages and disadvantages, and contrast pricing to similar systems. While other IP-based intercom systems require some form of head-end server, Pulse requires none. The biggest advantage that Pulse claims is that no central server is needed to create an intercom system. A single intercom unit is assigned 'system master' status, and associates the other units to route voice traffic independently. By eliminating the server requirement, several thousand dollars of hardware can be cut of out system designs, while still supporting the full features of each station. The 'serverless' design only supports 16 total devices. Therefore, Pulse is best applied to small, simple intercom applications. Large, distributed, and heavily integrated systems all require a central management server. Pulse cannot easily be used with complex subnetted networks and custom notification system integrations. Additionally, the system limit of 16 devices is a hard capacity limit regardless of network capacity or network capability of units selected. Additionally, all Pulse stations are 'PoE' powered, which eliminates additional power supplies and cabling. The system is designed to work on Fast Ethernet switches, and all devices consume less than 7 watts. This means that even the lowest tier of network switches can work with a Pulse system. Every Stentofon IP station is Pulse Enabled. While Pulse only works with Stenofon's IP line, every form factor of intercom is supported. Desktop stations, wallmount stations, and the vandal resistant/corrections models can compose an ad-hoc intercom network. This flexibility lends itself to being deployed in small/medium businesses that may require mixed intercom types. 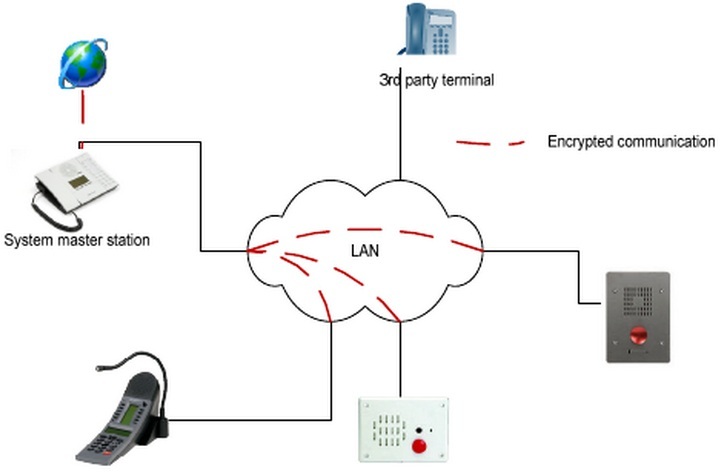 The major advantage of an IP based intercom systems are similar to IP video, in that the existing LAN can be utilized for an intercom system, saving the cost of discrete cabling. Additionally, integrating IP intercom systems into VMS or Command and Control platforms is less costly that analog systems, due to the elimination of intermediate digital audio encoders. The serverless Stentofon approach can reduce product costs by more than 30% for an IP intercom system. An average single door Stentofon station costs about $850 with 4 doors ~$34000, though price varies based on the number of stations and the types of stations selected. By contrast, a comparable Commend GE 100 intercom system cost ~$1400 per station or ~$5,600 for 4 doors. The cost increase is primarily driven by the cost of a head end server and additional power supplies. Contrast this to an analog based Aiphone AX system that costs around $550, including the cost of the head-end server. However, adding the cost of the 'IP encoder' (eg: Commend ET 901 D) brings the cost to around $2700 for a four door station. While this appears do be the 'best cost' option, it does not including the cost of additional cabling.